Just like the blues, Caribbean music owes much of its power to African rhythms brought to the New World by slaves–in this case, slaves imported to work on the sugar cane plantations. Rum was a by-product of the sugar-making process, and I knew this pie had to have rum. Who can think of the islands without thinking of coconuts? But most recipes for coconut cream pie omit that crucial ingredient. I finally found what I was looking for in a Caribbean cookbook I bought long ago at a flea market. It’s from the Time-Life series, a wonderful cookbook series dating from decades ago, when travel and exotic menus weren’t such an easy part of our lives as they are now. Nearly every cuisine you can name is represented in the series, and each gets two books—a big hardcover with pictures of food and festivals, plus recipes, and a small spiral-bound booklet with even more recipes. I have quite a collection of these cookbooks, assembled from garage sales, flea markets, and used-book stores. Usually I find either the big hardcover or the small booklet first, then have the thrill of finding the missing half of the set at some whole other venue. Anyway, the Time-Life version of the pie is very labor-intensive, so I invented a variation that uses the same flavorings—dark rum, nutmeg, and vanilla—but substitutes boxed pudding mix. The crust is a variation on one we’ve used before—very flaky and rich with butter AND lard. Mix the dry ingredients in a bowl and add the butter and lard. Use two knives scissor fashion or your fingers to mix the flour mixture and the shortening together till the result looks like coarse meal. Add 4 tablespoons of ice water, one at a time, tossing the mixture with a fork till it clings together. Add more ice water if necessary. Flour your hands and gather the mixture into a ball, wrap it in plastic wrap, and refrigerate it for ½ hour or more. When you are ready to roll it out, flour your rolling surface and rolling pin. Pat the dough gently into a circle an inch thick or even thinner—this makes it easier to keep a circular shape when you begin to roll. Make sure to use plenty of flour and rotate the dough from time to time, sprinkling more flour underneath to make sure it doesn’t stick to your rolling surface. When you’ve shaped it roughly into a circle large enough for your pie pan, fold it into quarters and gently transfer it to the pan, unfolding it and smoothing it to fit. Trim the edges, if necessary, so you have only an extra half inch all around. Now tuck the overhanging crust under. To make a fancy edge like in the picture, place the index and middle finger of one hand on the edge pointing out and with half an inch between them. Use the thumb of the other hand to push a little ridge into the dough, working your way all around the edge of the pie doing the same thing. Prick the bottom and sides of the crust with a fork. Let it cool while you make the filling. Bring the milk and pudding mix to a full boil, stirring all the while. Turn off the heat and add the coconut and other ingredients. Let the pudding mixture cool on top of the stove while you make the meringue. Stir the mixture occasionally. Beat the egg whites and cream of tartar until the egg whites are frothy, then slowly add the sugar, beating all the while. After a minute or two, the egg whites should become quite stiff. Continue beating until stiff peaks remain if you remove the beaters. Meringue can be tricky. To make sure you aren’t beating a soupy mess forever instead of getting the result you want, make sure the beaters are perfectly clean and there are no specks of egg yolk or shell in your egg whites before you start. You can scoop extraneous objects out with a spoon. Turn the pudding mixture into the pie shell. Spread the meringue over the top. 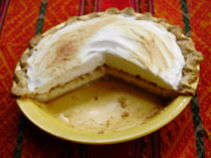 Make sure the meringue touches the inner edge of the crust–it has a tendency to shrink while it bakes and this will keep you from having bare spots around the edges of your pie. 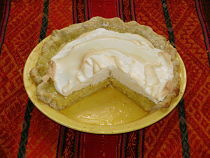 Bake the pie at 350 degrees for 15 minutes or until the meringue turns a delicate brown. Let the pie cool a bit and then refrigerate it. Serve it cold, and refrigerate the leftovers.